Recent studies have revealed that dogs often perform well in cognitive tasks in the social domain, but rather poorly in the physical domain. This dichotomy has led to the hypothesis that the domestication process might have enhanced the social cognitive skills of dogs (Hare et al. in Science 298:1634–1636, 2002; Miklósi et al. in Curr Biol 13:763–766, 2003) but at the same time had a detrimental effect on their physical cognition (Frank in Z Tierpsychol 5:389–399, 1980). 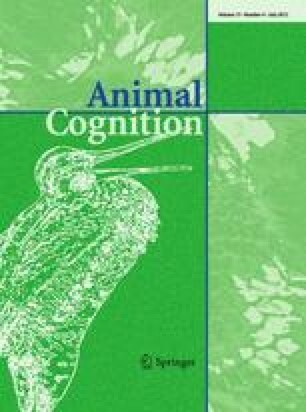 Despite the recent interest in dog cognition and especially the effects of domestication, the latter hypothesis has hardly been tested and we lack detailed knowledge of the physical understanding of wolves in comparison with dogs. Here, we set out to examine whether adult wolves and dogs rely on means-end connections using the string-pulling task, to test the prediction that wolves would perform better than dogs in such a task of physical cognition. We found that at the group level, dogs were more prone to commit the proximity error, while the wolves showed a stronger side bias. Neither wolves nor dogs showed an instantaneous understanding of means-end connection, but made different mistakes. Thus, the performance of the wolves and dogs in this string-pulling task did not confirm that domestication has affected the physical cognition of dogs. We thank Wolf Park and the Mountain Wolf Farm for being able to test their animals, Pat Goodman on helpful comments on the manuscript, Corsin Müller for helping with the statistical analyses, Katharina Kramer for reliability coding, Kurt Kotrschal for helping to establish the Wolf Science Center, 5 reviewers and Stephen Lea for their helpful comments to improve the manuscript, and many students and volunteers for their devotion and assistance with raising the animals of the Wolf Science Center. The project was financially supported by the Hochschuljubiläumsstiftung der Stadt Wien (H-2076/2008) and Austrian Science Fund (FWF) project P21244-B17. We further thank many private sponsors and Royal Canin for financial support and the Gamepark Ernstbrunn for hosting the Wolf Science Center.